35mm slide scanning & negative scanning. Our service includes digital cleaning. 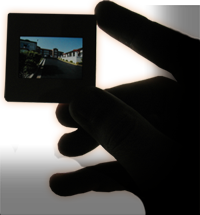 Transfer your slides & negatives to DVD or CD as beautiful digital images. Our Essex based slide scanning service really is second to none offering you the personal, human touch rather than anonymous bulk machine scanning. Free collection & delivery in the Chelmsford area for orders over £50 (small packages only). Images are scanned & copied then transferred into Photoshop to be individually enhanced and corrected to remove blemishes and dust particles. Your image is then expertly corrected & enhanced to bring out the natural feel & vibrancy of the original image, we then transfer to CD or DVD preserving your 35mm slide transparencies and negatives as digital photographs. We have a longstanding love for photography and especially, traditional film & slide photography. The quality of image that 35mm slide transparency film, such as Velvia 50, can produce is unrivalled. If you have 35mm slides or negatives that have been hiding in the bottom of a drawer, or maybe boxes of slides that have been inherited, let us bring them back to glorious life on your computer or tv screen. ..the quality is so much better than I expected. I look forward to seeing the rest.! ..Wonderful to see these on a big screen again. seeing more custom from me in the future..
Companies offering to scan your slides or negatives for a few pence are most likely offering just a basic slide scanning charge, minus any slide or negative cleaning and enhancement & digital dust and scratch removal. Very few scanned slides or negatives can get away without any digital cleaning - have a look at the example below. All our dust and scratch removal processes & enhancements are completed in Photoshop 'by hand' - this is not an automated mechanical process at Slide to Digital - we take pride in making your pictures look as good as we possibly can! We charge just 50p per slide which includes dust removal and scratch removal and a certain amount of digital enhancement to capture the original vibrance of the slide. You can send as many or as few as you please, we enjoy our work! Take a look at the example below, a slide is very small and will have attracted minute specs of dust that are unable to be seen clearly with the naked eye, blowing the slide up is effectively magnifying the dust as well as the image, and so small specs, scratches or other anomalies can become significant. The digital image on the left is a approximately 1/150th segment of an original scanned 35mm slide - in other words, a tiny segment blown up. You can see the minute dust specs, mould and blemishes that have gathered over time. On the right, the digitally cleaned image segment. Click here for more information.